Our Child's First Time In The Church Nursery! Today was a big day for baby Noah (and for us!) It was his first time ever in our church nursery…! That’s right, instead of being in our arms, safe and sound like he usually is, he left him in the care of our wonderful church nursery workers. Our church nursery staff is great so I had no reservations what so every of leaving him there. When I checked in on Noah in between services (our church has two services) our entire nursery staff couldn’t stop talking about how much fun they had with him! They also told me about how they had put on a worship CD and “praised God for the entire cd!” This was really cool to hear! In fact, I couldn’t get the thought out of my head of my little five and a half month old son smiling and “singing” praises to God. How incredible! He had a ball in the nursery! Later in the night my brother and I took Noah to see my wife at work so Noah could get a midnight snack – which he also enjoyed! We love this kid so much! 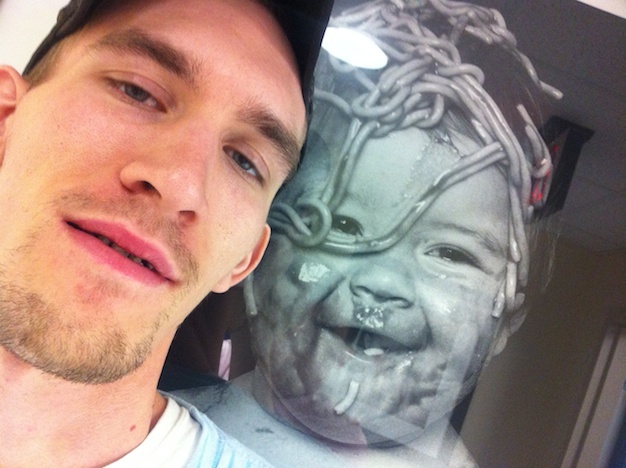 Noahs uncle and spaghetti boy! Are you flipping kidding me, that kid is so cute. You need to have more videos of him on here, that just made my day. He definitely made me smile. God Bless you and you and your precious family. Awwwwww…….! Thank you so much! That means a lot! I keep asking myself, “Does anyone really want to see videos of our kid…?? Ha,ha..so it’s encouraging to hear positive feedback! I’ve enjoyed looking at your video posts tonight. My son w/DS is 11 — whew! That time really flew by! But i sooo remember his first years and those instant transitions between looking like a deer in the headlights and flashing his beautiful smile for all the world to see. Noah is a beautiful, and obviously lucky little fellow. If Noah brings you half the joy that my Silas brings to me, you are truly blessed!